Schwimmen, also known as Thirty-One (no relation to the other game called Thirty-One that we’ve covered), is a member of the Commerce family of card games. It can be played with two to eight players. 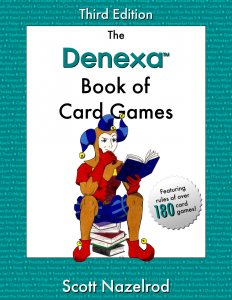 As with other games in that group, the game revolves around exchanging cards from your hand with cards on the table. Though known worldwide, it is most popular in Germany and western Austria. The object of Schwimmen is to form the hand with the highest point value by exchanging cards from the table with those from your hand. Schwimmen uses the 32-card deck common to many German games. 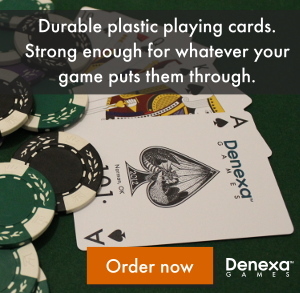 Starting from a standard 52-card deck of Denexa 100% Plastic Playing Cards, remove the 2s through 6s, leaving 7s through aces in each of the four suits. Score is kept using tokens, such as chips. Give each player an equal number—three works well. Shuffle and deal each player three cards. Then deal three cards, face down, to the center of the table. The remainder of the deck becomes the stock. Aces are worth eleven points, face cards are worth ten, and all others their face value. Suits rank (high) clubs, spades, hearts, diamonds (low), the same order as in Skat. Prior to the start of actual play, the dealer looks at their hand and decides whether they want to keep it. If they do, the cards on the table are simply flipped face-up. If not, the dealer discards their original hand, takes the three face-down table cards as their hand, then turns their old hand face up on the table. The player to the dealer’s left goes first. On their turn, a player may exchange one card from their hand with one on the table. If a player greatly dislikes their hand, they may elect to exchange all three cards. It is not allowed to keep one card and exchange the other two, however; it’s one or all. A player may also pass if they do not like any of the cards on the board. The turn then passes to the left. This continues until one player is satisfied with the value of their hand. They then close the hand (equivalent to knocking in many other card games). Each of the closer’s opponents gets one last turn, and the hand ends when the turn to play again reaches the closer. If an entire orbit around the table is made with every player passing, the dealer discards the three board cards. They then deal three new board cards from the stock. Schnauz: A hand, all in the same suit, with a value of exactly 31 points. This can only be achieved by holding an ace and two of the ten-point cards (the face cards and the 10). After a hand ends, each player calculates their score. The hand score, in most cases, is the value of all of the cards of its highest-scoring suit. For example, a hand of A♠-K♦-7♥ would score eleven. This is because the player holds three one-card suits, and the spade is the highest-scoring. However, a hand composed of A♠-K♦-7♦ would score seventeen, because the diamonds combine to outscore the lone spade. There are a few exceptions to this scoring method. Two of these are the special combinations described above. A third is that three-of-a-kind always scores 30½, no matter what rank it is. If a player wins with a Feuer, then each of their opponents loses one chip. Otherwise, just the player holding the lowest point total loses one chip. If there is a tie for lowest, it is broken by the suit of the player’s scoring cards. Ranks of three-of-a-kinds are broken by the rank of the three-of-a-kind. If there is still an unresolved tie, then both players lose a chip. The deal passes to the left, and another hand is played. Players will continue losing chips as further hands are played. When a player loses all of their chips, they are said to be schwimmen (German for swimming). 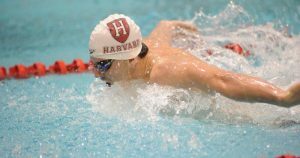 A schwimmen player can continue playing, but if they lose again, they are eliminated. Photo credit: Wikimedia Commons user Crimson2016 (licensed CC-BY-SA-3.0 Unported).